I just got back from taking Alex to his second swim class of this session and I'm not sure who's more exhausted. As usual, he is apprehensive about getting in the water initially and cries and screams "get out of pool" as soon as we get in. But once I distract him with one of the swim toys (especially floating letters since letters fascinate him these days) he turns into a completely different kid. Once he gets going in the pool there's no stopping him. He starts kicking his legs and doesn't stop until class is over. 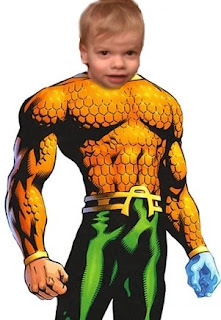 He splashes all over the place, loves jumping in the water and especially enjoys going under the water during dunk time. Today during the portion of the class where the instructor gives us a cup to pour water on each other, he just hogged the cup for himself and kept dumping cup full after cup full of water on his head. Everyone else in class had given the cups back but he just kept going strong. I really think part of him wishes he could live underwater. His only weakness in the pool is floating on his back. He can't stand it and screams and wiggles. All the rest of the kids tolerate it to some extent, but Alex wants none of it. He would rather do jumps or dunk himself. He's definitely his own person in the pool. 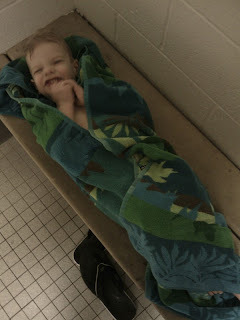 I can totally see him on a swim team in the future (not swimming the backstroke of course). Here's a bonus shot of Alex wrapped up in his towel cocoon after class. Adorable. I've been trying to "float" the kids on their backs during bathtime and Ned isn't a fan. He can kick though - maybe he and Alex would have fun together.